Hell Swamp | JTR Inc.
Hell Swamp is a 1,200 acre collection of farming tracts located in Beaufort County, North Carolina. The project is part of Phosphate Corporation of Saskatchewan’s (PCS) mitigation for a 12,000 acre federal mining permit, of which the successful issuance allows for an unprecedented 32 year authorization for future mining. The environmental firm CZR, Inc. retained Jonathan T. Ricketts, Inc. to assist with analyzing the existing farm sites for reversion into their historic state, including restoration of wetlands and headwater streams. Ricketts was responsible for performing onsite soil studies, current and proposed hydroperiod modeling and preparation of a thirty year water budget using DRAINMOD, a program developed by North Carolina State University. 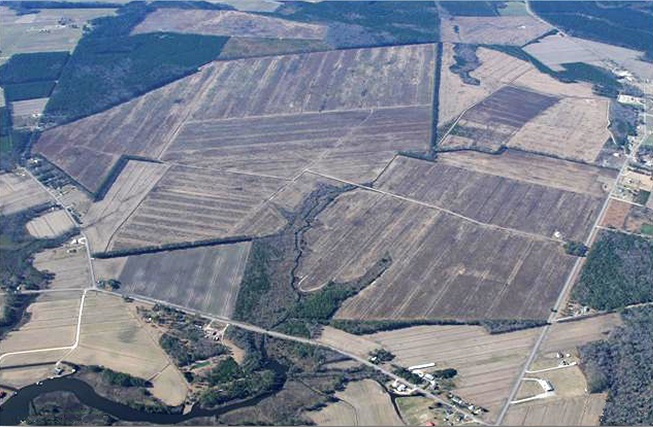 Ricketts then developed restoration plans for the wetland portions of the site and assisted with permitting through the Army Corps of Engineers and the North Carolina Department of Environment and Natural Resources. Construction management services were provided by Ricketts and construction was completed in 2010. The site will continue to be monitored for ongoing success for five years. Keys to Success: Relating complex technical data to all team members for their use in completing the design.